As a technology journalist, I’ve witnessed the smartphone industry innovate at a breathtaking pace. Today, the device that you carry around in your pocket can do much more than just make calls and receive text messages. You can track your health stats, plan a trek, make payments, book a cab, order food, switch off the lights and more with just a few taps on your smartphone. I have been using many of these features in my day-to-day life, and believe you me, life is much simpler than it was several years ago. Even so, I have always had one grouse when it comes to technology. Being an individual with severe hearing loss, it always irked me that tech companies and developers aren’t doing enough for people with disabilities. A few accessibility options in my smartphone aside, there’s not much else that specifically aims to make everyday life easier for me, and others who have different disabilities. But now it seems like the developers at Google have finally changed focus. The company recently announced two new assistive apps for the hearing impaired – Sound Amplifier and Live Transcribe. And going by my experience, they have the potential to be revolutionary. Before I delve into the real-life use cases of these apps, let’s get the specs and nitty-gritties out of the way. Google Sound Amplifier and Live Transcribe are self-explanatory, as the former enhances the volume and clarity of sound while the latter is a transcription tool. As you might have already guessed, Sound Amplifier is designed to boost the volume and clarity of sound for people who have milder hearing loss. The app facilitates boosting audio, fine-tuning the audio quality and reducing noise. The most helpful feature is the ability to tweak the left and right headphone settings, which is particularly beneficial for individuals like me who could hear slightly through one ear in the past. I say past because my impairment has grown worse over the years, which is where the Live Transcribe app comes into the picture. 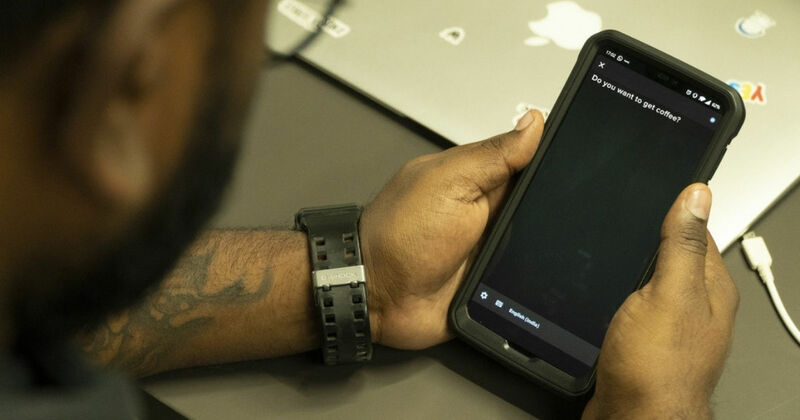 Google has worked in close association with Gallaudet University, an esteemed institution for hearing impairment research, to develop the Live Transcribe app. The app is a lifesaver for individuals like me who cannot rely on hearing aids. The Live Transcribe app incorporates 70 languages and dialects to convert speech into text in real time. The application also supports bilingual conversations and lets users select a primary and secondary language. That being said, Live Transcribe is still in beta and is available as an early access download on the Play Store. As such, the app does need a few improvements, which I will elaborate on in a bit. Bear in mind, I will be restricting my opinion to just the Live Transcribe app, as there’s no way for me to test Sound Amplifier. The first question that popped into my head when I heard of the Live Transcribe app was if it was any different from voice assistants like Siri or Google Assistant. After all, they can also listen to what’s being said and display it on the screen. After using Live Transcribe for a short time and having used voice assistants for a while now, two distinguishing traits of the new app made it stand apart. These are the two factors that make the transcribing tool truly helpful for the hearing impaired. First and foremost, Google assures users that transcribed conversations are saved on the user’s smartphone and not on Google’s servers. This feature allows me to have private conversations with my fiancée, best friends and family, which I wouldn’t want to be privy to others – in this case the servers that are used by voice assistants to work. The second is how the Live Transcribe app only transcribes what’s being said, letting you carry on a normal conversation. In the past, when I tried using Siri to have a conversation, the voice assistant ended up searching for anything being said and throwing up the results (which it’s meant to do), but this interrupted the flow of conversation. Google Live Transcribe: is it there yet? Google already has user-friendly assistive features (TalkBack to call out items on the screen for the visually impaired and Hearing Aid compatibility for the hearing impaired) integrated into Android for a while. However, they just are not up to the mark and need refinements to truly serve disabled individuals. Thankfully, with the launch of Live Transcribe, Google seems to be taking a step in the right direction. Having said that, as I have mentioned before, Live Transcribe is still in the early access phase and comes with several bugs. To begin with, the app doesn’t work all that well when more than two individuals are involved in the conversation. So, if you are like me, you can forget trying to be part of active conversation at the office party, and instead focus on a personal chat. Live Transcribe shines when used in one-on-one conversations, but even here there are some recurring issues. To begin with, for the app to transcribe the speech accurately, the speaker has to talk slowly with clear emphasis on each word. In case the person is speaking too fast or has an accent, the app gets muddled and at times autocorrects sentences or words to something that’s nowhere near what was actually said. Additionally, the speaker also has to be clearly audible for the app to catch what’s being said. I tried using it while walking on a crowded street of Delhi’s Hauz Khas area, and the result was not very helpful. You can still ask the person to speak closer to the mic on your smartphone though, and that works very well. I expect Google to iron out most of these wrinkles in the final release. Having used the app for some time, I have a checklist of things that could be improved from the perspective of a hearing impaired person. First and foremost, the speak back functionality of Live Transcribe should have an option to be turned off. You see, the app repeats everything that it transcribes, through voice. This is redundant for a person who can’t hear, and as such there should be a toggle in the settings to turn it off. I get that the feature is there for the person speaking to check if the transcription is accurate, but more often than not, it isn’t required. Further, the app’s inability to function in noisy environments is a nuisance. A possible solution could be a better noise cancellation algorithm, or alternatively a Google-issued list stating which smartphones Live Transcribe works best with. As they say, human beings are perennially greedy and I am no exception. I would love it if Google could find a way to integrate Live transcribe into voice calls. This way, whatever the caller is saying can be seen on the phone’s display and a deaf person would be able to handle basic phone calls. Google already has the technology in form of the Call Screen feature, it just needs to go the extra mile with Live Transcribe. You might wonder why I’ve listed so many issues with Live Transcribe, and yet maintained that it has the potential to change my life. Before I explain, picture this. Two years ago, when I was interviewed for this job, each question was painstakingly typed on a smartphone to make sure I understood it. Now imagine how convenient it would have been if Live Transcribe was made available at that time. While I still managed to land the job, having the app around would have helped me to answer some questions better. Another example of where the app could’ve come in handy was during a recent restaurant visit. As soon as I told the receptionist that I was deaf, she immediately shifted to sign language. While I appreciated the gesture, the irony was I’ve never learnt sign language myself, and I’m sure there are several others like me too. While training people in sign language is a bonus, it would be life-changing if restaurants and other stores could have a dedicated Live Transcribe display in front of counters connected to mics. The same use case is applicable in schools and colleges, with teachers speaking into a mic connected to a Live Transcribe display. This would go a long way into helping hearing impaired students understand concepts better (another big regret for me). There are so many other real-life situations I can think of where Live Transcribe could work – from client meetings to first dates. From a personal experience, the fear of missing out is at its peak when you are devoid of either auditory or visual senses. Live Transcribe is a ray of hope for me and other hearing impaired folk, since the possibilities are endless. I would go to the extent of saying that the Live Transcribe app, if polished to perfection and used on a large scale, can make it possible for the hearing impaired to lead a close-to normal life.